Here is one of the new additions. A really striking memorial in Portland and Kilkenny Stone for Kensal Green Cemetery in London. I took a road trip way out East last week to deliver some sculptures to the Lettering Arts Centre at Snape Maltings near the Suffolk coast. 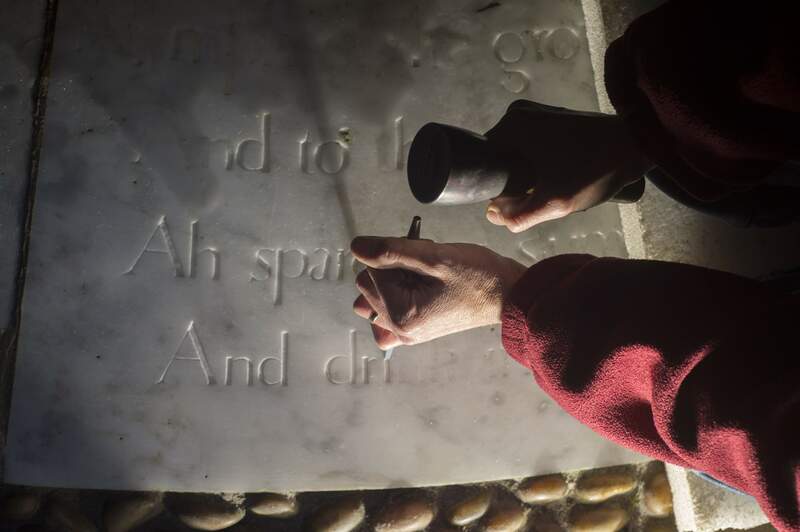 The Lettering Arts Centre is run by the Lettering and Commemorative Arts Trust which also operates Memorials by Artists. It’s a bit of a trek to get over there from Bath but I wanted to see the space and meet the staff who I have exchanged emails and telephone conversations with. It’s nice to put faces to names. I put a couple of word sculptures in for their Christmas showcase exhibition which opened on Friday and runs until 22nd November. Us and Q are carved from some off-cuts of Hartham Park Bathstone I had lying around the workshop for many years, and continue my interest in words as sculpture. I had a lovely lunch with Harriet Frazer who founded Memorials by Artists and who is one of the key people to have shaped my career as a lettering artist. She recently retired from running MbA after 27 years. There is a good article telling her story here. Afterwards I made my way to the sea at Aldburgh, and sat on the shingle beach as the last light faded. I spent the night in Cambridge and had a little wander round the next day before I went to visit a cycling friend from the Amos Roadclub, Kip Gresham, who runs The Print Studio. Kip works with all sorts of artists, some with international reputations, on their print making projects. The studio is a wonderful clean and well ordered space. It made me want to do some printmaking. Then back home, enjoying the charms of the M4 along the way. There is still time to see this exhibition which I have contributed to at the Street Road Project Space, USA, which closes on the 31st October. I worked on a project earlier in the year with the Japanese artist Kaori Homma called the Meridian Stone Project, which is being shown as part of “Sailing Stones”. 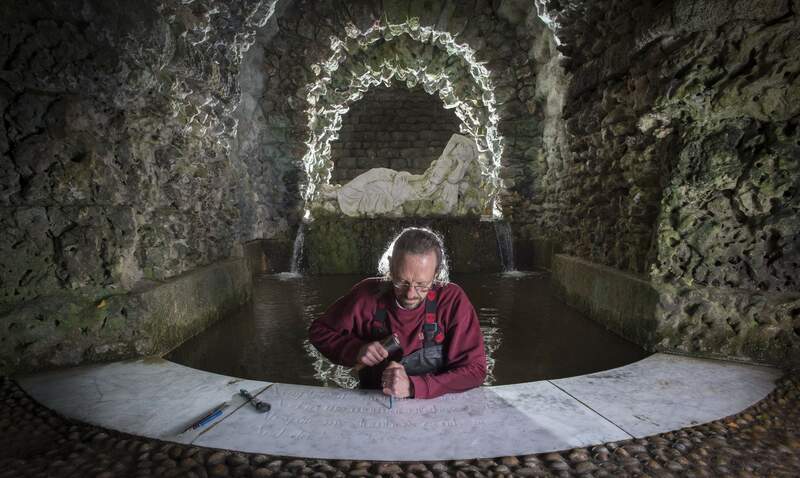 “This project is an extension of Homma Meridian Projects an ongoing work which re-sites the Greenwich Prime Meridian in different locations around the globe, invoking the power-centered nature of demarcated boundaries and space. 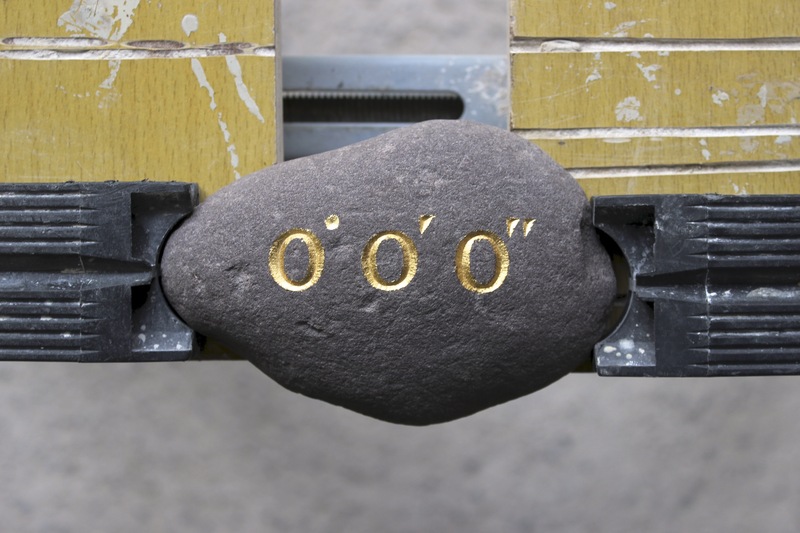 Homma’s Meridian Stone Project is an ongoing collaborative work: a stone taken from Street Road, and carved with the longitudinal coordinates 0º0’0’’ is mailed from artist to artist. The Meridian Stones have traveled to Korea, Japan, Taiwan, Hungary, Ivory Coast, UK, USA, Taiwan and New Zealand, and are still going to places handed from artists to artists around the world. 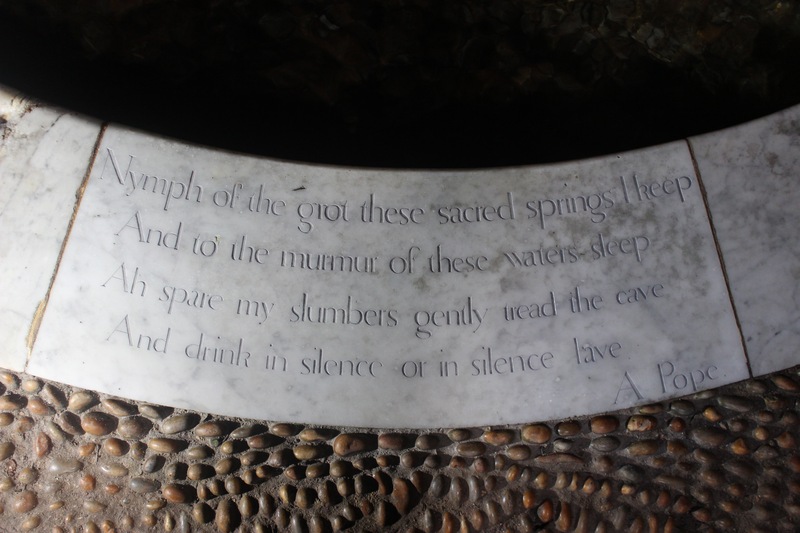 My contribution was to carve the longitude coordinates 0º 0’ 0’’on the stone and to take a photograph and write a text to accompany my image. I was thinking about scale and placement. Where is this stone’s prime meridian? What are the right coordinates for these zero’s? How big should their footprint be? I was thinking about ellipses within ellipses, and figure/ground relationships, and little upside down right angled triangles connecting time and space. I was thinking about the clockwise and counter clockwise orbits of 3 mm of sharp tungsten. The rhythm of hammer on chisel. Breathing and being precise. I was thinking about hours, minutes and seconds. Not thinking about the time but remembering to count it. Carving time from my other deadline. Spring is springing and the Easter holiday is nearly here – It is the season when people’s thoughts turn to their gardens. I am having a little publicity push on Garden sculpture commissions. I have been working on headstones all winter and although I like making memorials, as the sun begins to warm the earth, I feel the need to make some celebratory work. 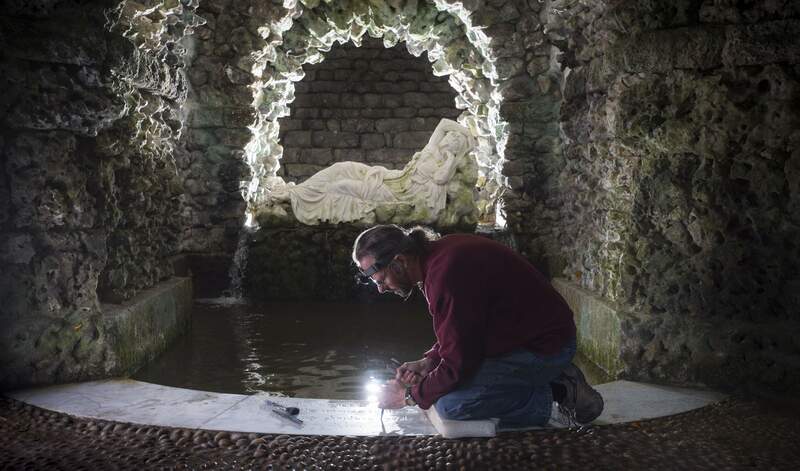 As we approach Good Friday, I reflect that my work through the winter has been focused on the theme of death. Easter Sunday is nearly here and I am looking forward to making some work which celebrates life. 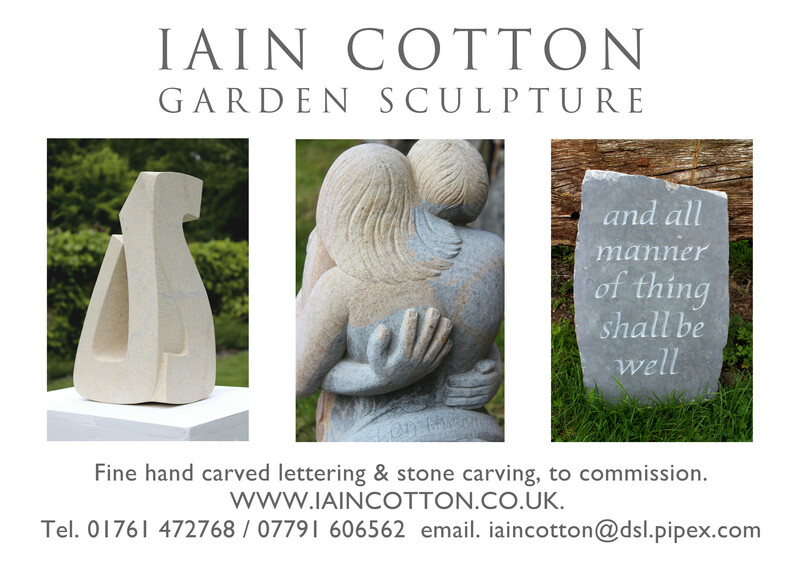 If you would like to commission a sculpture or inscriptional art work for you garden please get in touch.